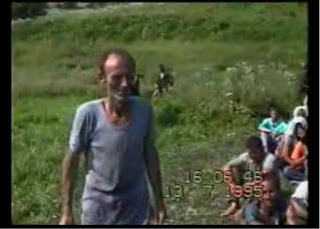 INTRO: In July 1995, Serbian journalist Zoran Petrovic filmed the Srebrenica genocide unfolding, and then he attempted to cover up the evidence by cutting out and erasing important scenes. 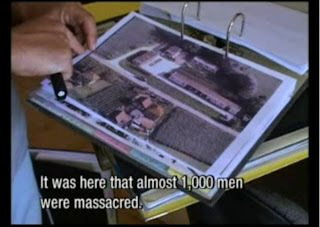 We invite you to read the following article and then watch the full documentary [Bosnia - Lost Images, 29 minutes, originally aired June 30th 2003]. Everyone remembers the harrowing footage of the Srebrenica massacre shot by Zoran Petrovic, the only cameraman to capture the events on film. But this week’s fascinating documentary shows that the very worst of his pictures never reached our TV screens. Key scenes from Petrovic’s rushes were ‘lost’ or blacked over, presumably to prevent reprisals. We unearth the lost images, and the completed jigsaw is even more heinous than the already blood-spattered picture. Amazingly, Petrovic has never been interviewed by the War Crimes Tribunal about what he saw. For the first time, his incriminating material is available for scrutiny. Under the watch of Dutchbat soldiers, queues of Muslim men and women are separated by one of General Mladic’s men. 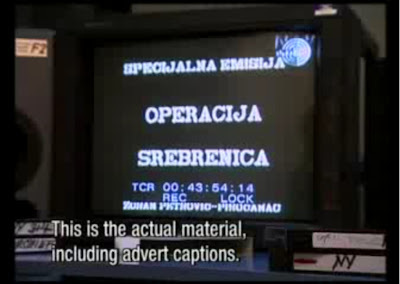 They are familiar images, broadcast by TV stations around the world in the wake of the Srebrenica massacre. The War Crimes Tribunal in The Hague used Zoran Petrovic's tape to secure several prosecutions for the massacres in the early 1990s and to investigate the involvement of Dutch peacekeepers Dutchbat. But the footage shot by Petrovic appears to be incomplete. There is only one 60 minute tape for two days of filming, and throughout the rushes there are black gaps, cutting right through scenes and camera movements. Petrovic insists he was told to black over those sections by officious checkpoint guards on the roadside: “Everyone wants to be a smart guy. I was told – ‘Don’t film these guys. You erase this’”. But Jean René Ruez, the man charged with analysing film evidence for the War Crimes Tribunal is adamant Petrovic is lying: “The cuts were done later. Sure”. Journalist John Block agrees. He was granted access to the rushes when they were first aired on Belgrade's Studio 3 that same day – July 14th 1995. He insists he saw two tapes. 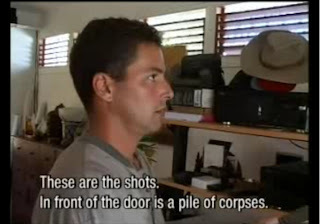 He remembers clearly seeing unadulterated shots of piles of bodies – the material now missing from Petrovic's sole remaining tape. When the BBC called Studio 3 the next day, the incriminating tape was gone, and the other tape was blacked. A copy of a copy of a copy of the original Studio 3 documentary proves they are right. Although the quality of the footage is poor, there are no gaps. “This is of exceptional importance to the prosecutor” smiles Ruez. "They let you see what the witnesses are talking about. The recordings will help to furnish proof at a future trial of Mladic." 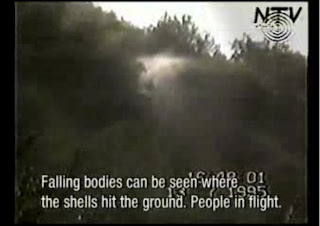 Among other things - such as the use of German shepherd dogs to hunt Bosnian Muslims and the indiscriminate shelling of refugees - the previously missing pictures show the physical evidence of the Srebrenica massacre. Dead bodies are piled up at the Gravica warehouse. Shooting is clearly audible in the background. The massacre has long been known about, but until now there has been little hard evidence. Only two survivors from over 1000 refugees seeking shelter in the warehouse survived to give testimony - the only witnesses to talk of a massacre. Both were Bosnian Muslims. “The witnesses are from warring factions” explains Ruez, “so you have to be careful what they say. This confirms the testimonies”. Chief prosecutor at the War Crimes Tribunal Mark Harmon agrees: “It’s very important footage. Pictures do not lie. This is a very graphic image confirming the massacres took place. It’s important to enlighten the public in Srpska if there is going to be any kind of reconciliation”. So far, the Yugoslavia Tribunal has never spoken to cameraman Zoran Petrovic. He still denies he was part of any cover-up operation and even offers our journalist a “last warning” when pressed. But these shocking new images had certainly been covered up by someone and their disappearance has hampered moves towards justice and reconciliation. Their discovery is a key step in helping bring Yugoslavia closer to closure. Optional: If you wish to buy DVD quality of this documentary, you can do it from Journeyman Pictures here. It's €24.50 including shipping and handling.